Providing expert Baumuller servo motor repair to clients across the nation, TigerTek is the partner of choice for hundreds of facilities, from small to large. Our dedicated servo repair facility includes an in-house machine shop and electronics lab, where all Baumuller servos are repaired, run-tested, and returned with a one-year guarantee. Our technicians are certified, highly skilled, and have experience in repairs for all Baumuller servo motors, stepper motors & brushless motors. Baumuller motors are available in a huge variety of sizes & configurations, and are used in multiple industries. With such a wide range of potential motor variations and applications, repairing Baumuller servo motors can be a complex task. 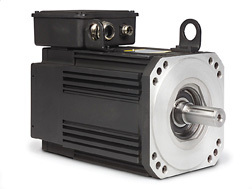 TigerTek's experience and technical knowledge ensures that your Baumuller motor is correctly repaired, using parts from our large OEM inventory, and returned to like-new condition before being shipped out. Our electronics laboratory is equipped for repairs at the component level (resolvers, encoders, tachometers, feedback devices, tachsyns or hall effects). Damaged motor housings and sleeved end bells are handled in our machine shop; damaged shafts are remanufactured or repaired, then dynamically balanced to eliminate vibration. TigerTek is the industry expert for Baumuller servo repair. Contact us today for your servo maintenance needs.